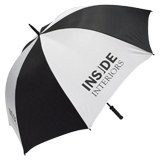 Promotional umbrellas are a great product for outdoors promotions. 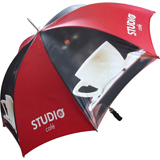 Customers will keep your promotional umbrellas handy and take them outdoors. They are also a highly visible product, and will get your message out across the country! The promotional Spectrum Sport umbrella is the complete customizable promotional umbrella product. Featuring a choice of 13 interchangeable coloured shaft or spike options and 22 handle options, plastic pistol grips only as standard. 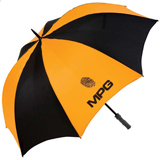 The tempered steel ribs make this the 1st choice in promotional wind proof sporting umbrellas. The most cost effective Spectrum golf umbrella is the Spectrum Value Stormproof 75cm ribs. Black stem and black pistol grip handle as standard. Various colour ways are available from stock. Full colour "LOGO SUB" now available on ready made stock items. The Spectrum Sport Golf Umbrella is the Ultimate golfing umbrella. 10 inter-changeable colours to choose from in the handle, tip cup, stem and spike (more handle options are available). Choice of over 60 panel colours in any combination or why not "TOTAL DYE SUB" the canopy? Reliable sports frame with carbon steel storm-proof ribs. Spectrum Pro Sports umbrella with our ultimate ergonomic handle with integrated spring loaded tip cup. 75cm tempered carbon steel, storm proof frame on modern and lightweight 14mm stem. Choice of over 60 panel colours in any combination or why not "TOTAL DYE SUB" the canopy? Frame available in Black, Navy and Fiberglass.